All Season Fuel Treatment with Lubricity additive to restore lubricity to Low & Ultra Low Sulfur Fuels. The Hi-Tech Lubricity Improver, Treatment and Conditioner for today's fuels. This product can handle any fuel; ULSD, Jet A, JP-8, and more. Use for trucks, buses, marine applications, power generation, industrial boilers, construction, railroad, government/military, and automotive. EnerFuel is the All-Season Treatment for Diesel and other Fuels to Restore the Lubricity to Low and Ultra Low Sulfur Fuels, Improve Fuel Efficiency, Increase Power, Reduce Emissions, Reduce Engine Wear, Stabilize Fuel, and Eliminate the Harmful Effects of Water in the Fuel.EnerFuel is an organic based product that when used as directed will bring the Lubricity of Low and Ultra Low Sulfur fuels to meet or exceed the manufacturers B.O.C.L.E., S.L.B.O.C.L.E., and or H.F.R.R. requirements. Additionally, it is a powerful fuel system cleaner. It dissolves the gum, varnish, and carbon deposits that distort injector or burner spray patterns and damage delicate injector and pump components. Cleaning these parts allows your engine to operate with all the efficiency that the manufacturer designed into it. For best results, use every time you fuel, adding contents to fuel tank(s) prior to fueling. The fueling process will then ensure that complete and proper mixing takes place. Treatment ratio is 1:1000 which equals 32 oz. per 250 gallons, or 1 gallon per 1000 gallons of fuel. First time users can use a ratio of 1:500 which is 32 oz. per 125 gallons, or 1 gallon per 500 gallons of fuel to speed the cleaning process. When operating in extreme conditions, i.e. marine, high humidity, poor quality fuel, it is acceptable to use 32 oz. per 125 gallons (1:500) on a regular basis. 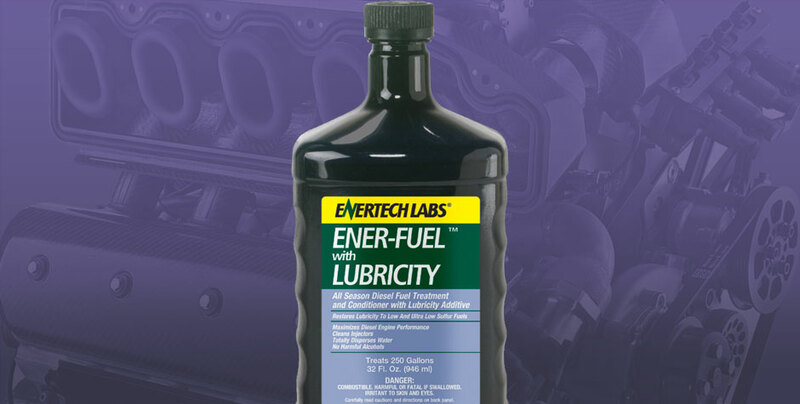 EnerFuel with Lubricity will eliminate approximately one half its own volume in water. For cold weather operation with Lubricity additive, we suggest the use of CFT – Complete Fuel Treatment.